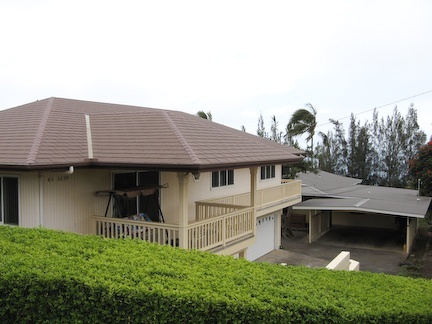 Hilo Listing of the Day! Large 13,168 sqft.lot with TWO homes Completely separate. Ideal for large Family Compound or rental income. Close to Down Town Honokaa. Hospital,Shopping, Movies, Restaurants, School and Church. Ocean and Mountain Views. Great location for friends and family to get together. The TWO homes are very well kept and maintained. Each Home has it's own laundry as well as separate Water and Electic meters and closed garage and covered double carport. Hard to find situation. One home is two stories and the second a single story. Each with it's own view. The homes have playrooms or dens as well as small office space. © 2019 Hawaii Information Service (MLS) All rights reserved. Information deemed to be reliable but not guaranteed. The data relating to real estate for sale on this website comes in part from the Broker Reciprocity Program. Real estate listings held by brokerage firms other than Pacific Coast Properties Inc are marked with the BR logo and detailed information about them includes the name of the listing brokers. Listing broker has attempted to offer accurate data, but buyers are advised to confirm all items. Information last updated on 2019-04-21.